The 2012 edition of the 1:1 million scale Surface Geology of Australia is available online as a free download and as a data package on DVD. The dataset is a single, seamless national coverage, with the geology edgematched at all map tile and jurisdictional boundaries. It is compiled mainly from 1:250 000 scale mapping. Interactive Maps is a discovery and exploration view of Geoscience Australia's geospatial services. The following scientific and decision support themes have curated content comprised of maps and functions. Each map has queries and functions with linked access to OGC (Open Geospatial Consortium) web services and metadata. This system replaces MapConnect and AMSIS applications. The new 2012 edition updates the previous 2010 data with new or revised mapping in the Northern Territory, north-west Queensland, Western Australia and South Australia. The new dataset also updates the stratigraphic and descriptive information for geological units to the best available in 2012 from the Australian Stratigraphic Units Database, and the dataset has been restructured to now be fully compliant with international geoscience data standards. 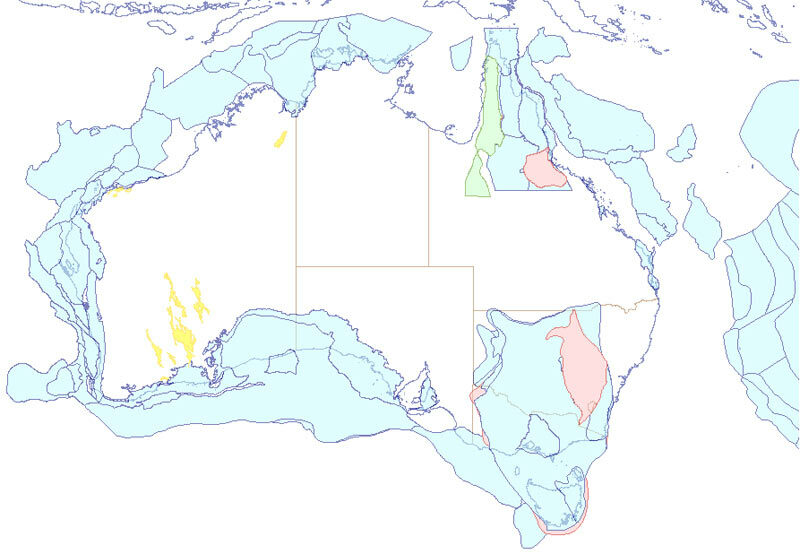 The Continental Geology Section also maintains the less detailed 1:2.5 million scale Surface Geology of Australia digital dataset and the Geological Regions of Australia. Scanned 1:250 000 scale geological maps of Australia are available though the Australian Geoscience Portal, a collaboration of Geoscience Australia and the State and Northern Territory Geological Surveys. This website is being progressively updated as new maps become available. The Australian Stratigraphic Units Database is the authoritative source of the names, descriptive attributes and source references of all units used in Australia, including their historical usage. The database is maintained for the Australian Stratigraphy Commission. New and improved online tools are provided for users to find information from the Australian Stratigraphic Units Database. Users can search for units by name, age range, State and other attributes. Users can retrieve the entire stratigraphic hierarchy of a unit (ie, both parent and child units), chemical lineage (ie, suites, supersuites) and details of related units as well as map sheets and publications which describe a unit. The Australian Geological Provinces Database online mapping tool provides boundaries and descriptions of rock packages related in space and time through a common geological history. At its simplest, a province may describe a basin and its fill (eg, the Eromanga Basin). However, provinces may also be defined by magmatic genesis or by more complex overprinting processes such as metamorphism, deformation and metallogenesis. Provinces have been compiled at a nominal 1:1 million scale for most of the marine jurisdictional area, but, at this stage, only parts of the onshore continent are covered. The Australian Crustal Elements dataset (1998) is available for free download and describes fundamental, large scale elements interpreted largely from geophysical (magnetic and gravity) data. This dataset is currently being revised to take into account recent national gravity and magnetic data compilations and new data sources such as magneto-tellurics, crustal temperature and seismic data. The first edition of a new, seamless 1:5 million scale Regolith Map of Australia is available in both PDF and digital format. This first edition does not yet represent a complete national coverage. Instead, it is an early release of work in progress towards such a national coverage and consists of a seamless regolith coverage of the Northern Territory, Queensland and South Australia. Work is in progress to add coverage of Western Australia, New South Wales, Victoria and Tasmania, and is expected to be complete by the end of 2014. This work is the product of collaboration between Geoscience Australia and the State and Territory Geological Surveys.